Added by Indo American News on October 11, 2018. 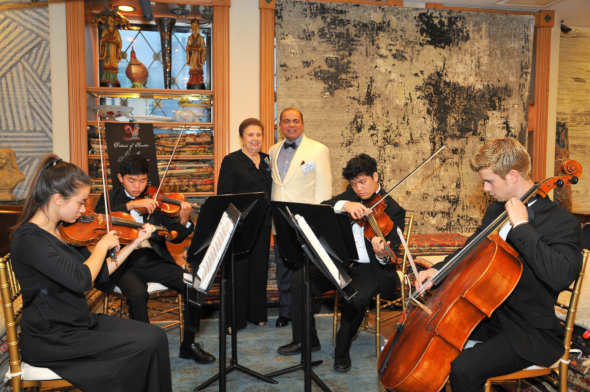 Virtuosi Quartet with Sam Abraham and Houston Symphony Board Member Helen Schaffer. HOUSTON: Enchanting Western classical music and zestful Bollywood dances were the highlight of an inaugural collaborative event hosted by the BIO (Blending Inner Voice with Outer Actions) program of SOS (Share Our Secrets) and Abrahams Oriental Rugs on Friday, September 28, 2019. 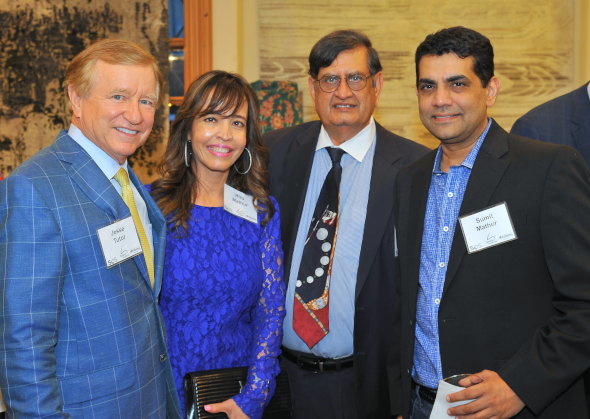 Former Symphony board member and active supporter, Samuel Abraham and his wife, Omana, opened the doors to their flagship rug emporium in the Gallery area for attendees to mix, mingle and join forces to further the missions of both BIO-SOS and the Houston Symphony. The event provided an opportunity for more than 120 Houston’s leading dignitaries to learn more about both organizations while enjoying an Italian dinner by El Tiempo Catering, a classical music rendition by the Virtuosi Quartet, dancing by Bollywood performer Henna Shah, and tunes from DJ Chante J. Chiverton. The Abrahams’ talented son-in-law, lawyer Raj Duvvuri, even stepped up for a solo. Houston Symphony’s Jesse Tudor with Hiru Mathur, SOS Founder Biki Mohindra and Sumit Mathur. The evening’s formal program began with Sam Abraham welcoming the guests and introducing board members of the Houston Symphony and the SOS leadership, including SOS founder Biki Mohindra and BIO President Preity Bhagia. Emceed by Ms. Bhagia, the night featured heartfelt speeches regarding the importance of the mission and outreach of the Houston Symphony, the Life and Leadership Program (LLP) of SOS, and the mission of BIO, the women-only program which helps its members lead an authentic life by learning how to both listen to their inner voice and deal with the outside world with a giving and unselfish approach. OS & BIO members Mani Subramanian (left), Anasuya Kabad, Preity Bhagia, Qusai Maheshri, Anuradha Subramanian, Vijay Bhagia, Nita Singhal and Sam Abraham. 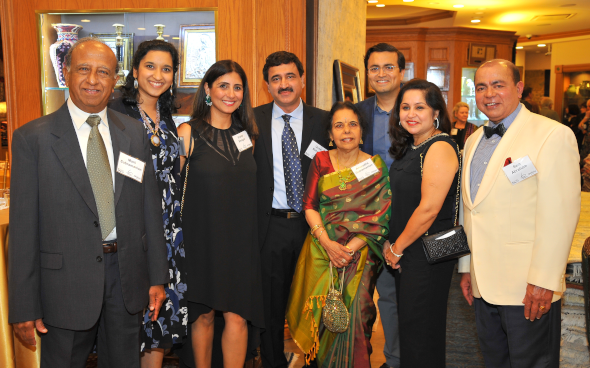 Mohindra also praised the Abraham family for their philanthropic leadership, including donating valuable rugs to major Houston organizations such as the Houston Symphony. Other speakers at the event included Susan Arnoldy Hanson who was the Abraham’s very first interior design client in the 1970s, Mary Beth Mosley, Community development officer for the Houston Symphony, Helen Shaffer and Betty and Jess Tutor, all long-time members of the Symphony’s Board of Directors. The Abraham’s daughters, Annie Thomas and Rachel Duvvuri offered touching words for their parents. A raffle raised over $1,200 for the Houston Symphony.